Although it is common to install wider boards much like strip flooring, they are more sensitive to changes in moisture content because their greater width allows for more dimensional change per board. Consequently, you need to take some extra measures to ensure a durable installation. Before nailing down the first wide plank board, make sure the flooring has been acclimated within 2% of the sub-floor moisture content. Pay special attention to plainsawn planks, as they are more susceptible to cupping than strip flooring or quartersawn planks. 100 lb. of force, each sq. ft. of flooring would be held down with slightly more than 700 lb. of force. The fastener spacing for blind-nailing is decreased on plank flooring to a range of 6 to 8 in., but this still provides about only 400 lb. of force for 7-in.-wide planks, a common dimension. Wider planks would be even less securely fastened. 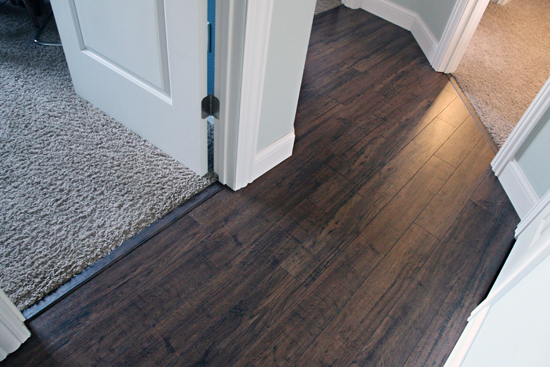 As a result, plank flooring requires either face-nailing, screws, or adhesive for additional holding power. The additional holding power will help minimize cupping, but it’s virtually impossible to stop wood from changing dimensionally with variations in moisture content. The easiest way to provide additional holding power for plank flooring is to use construction adhesive. it is easier to apply the adhesive to the subfloor than to the back of the board, so i start by marking the width of the plank on the subfloor. Staying between the previously installed board and this mark, i place beads of adhesive on the subfloor every 10 to 12 in. and 1 in. from the board ends. A3/8-in.-wide bead of construction adhesive provides about 70 lb. of holding force per linear inch. so a 7-in. bead would hold the plank down with about an additional 490 lb. of force. Added to the roughly 400 lb. per sq. ft. holding power of the blind nails, this brings the holding force per sq. ft. well beyond the 700 lb. of properly nailed strip flooring. Since it is impossible to glue to paper-type moisture barriers, i use Bostik’s MVP urethane membrane, which bonds well to construction adhesive.